“I’ve been waiting for you!” I look over to see two people adorned in silly holiday attire. They are a friend and mother of one of my students calling out to me! After a few snaps of the shutter another voice chimes in, “I’d like a picture with you as well!” Before I know it, I have taken pictures with five different families – all of them an important part of my life. 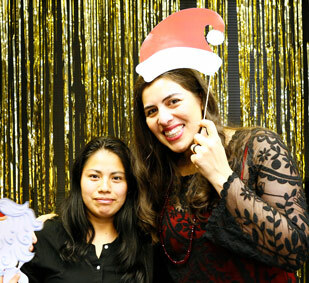 Every year at the Casa Chirilagua Christmas celebration our tradition is to have a fun photo booth. Kids pose in silly holiday attire while families pose in their more serious attire – and sometimes vice versa! We as staff get invited into each their memories and have shared this tradition for years now, each year creating new ones. As a seasoned Casa Chirilagua staff member I’ve had the joy of attending five Casa Chirilagua Christmas celebrations. Being invited into these family photos has often been my personal highlight. Every year it has filled my heart with joy and delight. The time spent celebrating with our families, students and volunteers makes this gathering one of my favorite annual events. The event includes four performances – created and executed by students and parents – with enough food to feed each guest at least three times. Guests are warmly greeted by volunteers sitting at tables dressed with twinkling tea lights and pine cone Christmas trees. These are courtesy of the skilled hands of our Kids Club students. In addition to creating the décor, students invest hours perfecting skits for our audience. The mood is joyous, festive and full of excitement as guests watch these students perform. This year’s hosts, Staff member Liz Wang and board member Sergio Chavez lead us through games, tell us jokes and give shout-outs to the audience – all the while effortlessly navigating the English and Spanish interpretation. A highlight of the evening is the raffle. Parents, students and volunteers alike sit on the the edge of their seats as kids club students take turns picking the winning tickets, reading off the numbers and handing out prizes. However, this year’s raffle is particularly joyous and meaningful. Two days before the celebration I receive a phone call from Mari*, a mother of a student who participates in the Middle School Program. Mari comments, “I hear there will be a raffle at the Christmas celebration. 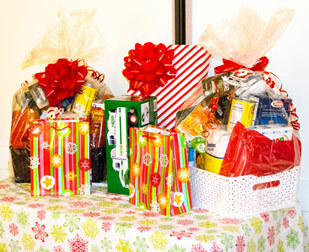 I would like to put together two gift baskets and donate them for the raffle. Is that OK?” I respond with an emphatic, “Of course!” Meanwhile I have no idea that Mari is going to deliver the MOST popular raffle items of the night. She arrives with two big and HEAVY baskets filled with useful household items. The baskets are so professionally done that I start kicking myself for not claiming my own raffle ticket! Shouts of, “It’s me, it’s me!” erupt as the first basket is claimed. Then again when the second is claimed. The winning families are ecstatic. Others who are sitting at their tables admire what is now essentially the “Grand Prize.” I watch the community assign incredible value to the baskets and the families celebrating over their prizes, then I look over to Mari. She gives me a big, sweet smile. She is filled with delight in the joy her gift is bringing to those who have received it. See more photos of the event on our Facebook album!